Visit Atlantic City, not to build but to destroy! I really enjoyed this game! Having grown up with Monopoly as the only game we had in the house, I cannot bring myself to play it. This twist on the old classic is great! I find that it has plenty of replay value. Since dice are involved, the game has a large luck component to it, making its outcomes different every time. Also, the figures and the art are amazing. The box itself is a bit unassuming, but once inside, brace yourself for some great components. We did not use the Tomes in our play, so I don’t know how that element works. I will say that the Gate cards are a tad confusing and are the reason I gave this 3 stars in easy to learn. We are still figuring out what some of them do. A very fun game that is easy to learn and play, but that’s not what you’re hear for, please let me give you the scoop. 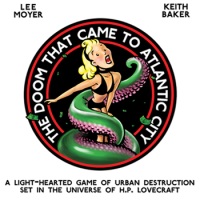 The Overview: In The Doom that came to Atlantic City you take on the role of one of eight gods in the Cthulu mythos. You will rampage and pillage throughout Atlantic City, opening your personal gates to bring forth your reign of terror upon the Earth. The Rules: At first blush this game resembles the board game classic, Monopoly. However, a deeper delve reveals something very different and strange indeed. The object of the game is to destroy buildings on each named space to open six of your gods gates, the first to open six gates wins. You also are given a ‘Doom’ card with certain win conditions on it, complete the conditions and you also win. During your turn, you roll two six-sided dice to determine how far you move, then once there you are faced with several decision points. If there is another player token on that space you must have a combat, if there is a player in the same colored zone as you then you may choose to fight them or not. If you choose not to fight, or are successful, then you move into what’s called the Destruction phase. Here, you roll the dice to determine if you destroy a house that’s currently on the space you landed, if you remove the final house you place one of your gates there. All of this gets thrown through a loop, however, because each deity has his/her own special abilities that augment themselves or punish their opponents and you have the opportunity to pick up additional powers along the way. Providence cards add a static variable or ability to your character where Chants cards provide a one-time, powerful benefit or hindrance. You can utilize cultists and houses as sacrifices for these powers. The gates also provide some shenanery in the form of movement choices. If you start your movement phase from a gate you can freely move from any gate of that god as if you were on that space. The Art: The game board has some very good artwork, there are eight landscape images of various Chthulu Mythos realms and the cards and player boards are very well done. The best part about the aesthetic of this game, though, are the pieces. Absolutely some of the most detailed and impressive looking game pieces I’ve ever really seen outside of a Fantasy Flight game. The only caveat is that the pieces are grey, but really, it actually kind of fits if you have a small understanding of the Cthulu mythos as the colors that these beings are not meant for human eyes. Good artwork, sturdy construction. The Gameplay: The game flows almost exactly like a game of monopoly but only takes about 30 minutes to play. One person at a time takes their turn while the rest wait patiently and chat amongst themselves or mock the current player for their deities terrible existence. There is some downtime, but the game doesn’t last that long so I can forgive that. The Opinion I like this game. It’s not my favorite, but it’s a great casual game. It’s playful and funny, easy to learn with a simple premise. This game is a favorite of those in my group who prefer games that are light on strategy but foster a playful experience. With its’ twisted, Chtuloid monopoly-esque feel it calls to those who are fans of that mythos no matter what kinds of games they enjoy playing. It takes less than an hour to fully set up, play and put away so it’s great for a game night where you want to get several different games in and it’s even great if you have an hour to kill in an evening. One of the most impressive things about it is that it is the fruition of a Kickstarter scandal saved by Cryptozoic. You can google the story, it’s quite interesting. I like this game and recommend it to just about everyone. Add a Review for "The Doom That Came To Atlantic City"